The INTEGREX e-V II Series encompasses Multi-Tasking Machines that are complete fusions of CNC machining centers and vertical turning centers. 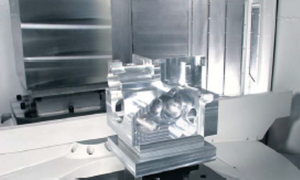 These combinations of machining centers/turning centers are by far the most advanced Multi-Tasking machines in the industry. 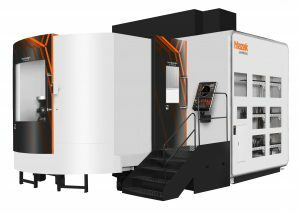 Complete all operations in a single setup – turning, milling, drilling and more with Mazak’s DONE IN ONE® machining concept that can be applied to small to large very complex parts. 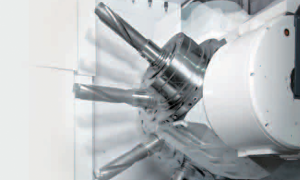 Machines include B-axis tilt milling spindles and C-axis turning spindle tables. Machine configurations are two pallet or single table (S) versions. 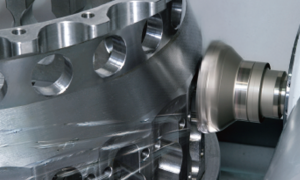 5000 rpm spindle for the machining of difficult-to-machine materials and the high speed 15000 rpm spindle for the machining of nonferrous metals are optionally available.